© Copyright 2018 The Associated Press. All rights reserved. 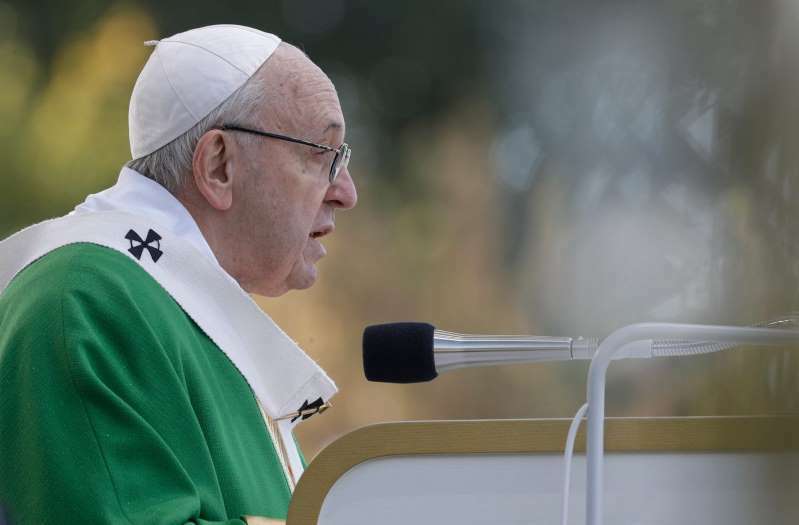 Pope Francis delivers his message as he celebrates Mass at the Santakos Park, in Kaunas, Lithuania, Sunday, Sept. 23, 2018. Pope Francis warned against allowing the rebirth of "pernicious" anti-Semitic attitudes that fueled the Holocaust during a visit to Lithuania that commemorated the country's Jewish community -- a group that was almost obliterated during World War II. "Earlier generations still bear the scars of the period of the occupation, anguish at those who were deported, uncertainty about those who never returned, shame for those who were informers and traitors," Francis told the crowd, which was estimated by the local church to number 100,000, according to the Associated Press. "Kaunas knows about this. Lithuania as a whole can testify to it, still shuddering at the mention of Siberia, or the ghettos of Vilnius and Kaunas, among others." In countries across Europe, including Lithuania, far-right, xenophobic and neo-fascist political movements are making gains. Francis recalled that Sunday marked the 75th anniversary of the final destruction of the Ghetto in the capital Vilnius, which had been known for centuries as the "Jerusalem of the North" for its importance to Jewish thought and politics. Each year, the Sept. 23 anniversary is commemorated with readings of the names of Jews who were killed by Nazis or Lithuanian partisans or were deported to concentration camps. The pope denounced those who get caught up in debating who was more historically virtuous and fail to address the problems of the present — seeming to reference historic revisionism that is afflicting parts of Eastern Europe as it comes to terms with wartime-era crimes. He warned against the temptation "that can dwell in every human heart" to want to be superior or dominant to others. And he prayed for the gift of discernment "to detect in time any new seeds of that pernicious attitude, any whiff of it that can taint the heart of generations that did not experience those times and can sometimes be taken in by such siren songs." Francis noted that he would pray later in the day at a plaque in the Ghetto itself and called for "dialogue and the shared commitment for justice and peace." Francis will also visit the former KGB headquarters in Vilnius that is now a museum dedicated to Soviet atrocities, and will hear from Archbishop Sigitas Tamkevicius, who was persecuted by the Soviet regime and was detained in the facility's chambers. Francis is traveling to Lithuania, Latvia and Estonia to mark their 100th anniversaries of independence and to encourage the faith in the Baltics, which saw five decades of Soviet-imposed religious repression and state-sponsored atheism. Lithuania is 80 percent Catholic. Francis' trip changed its schedule three weeks ago to allow him to acknowledge the slaughter of some 90 percent of Lithuania's 250,000 Jews at the hands of Nazi occupiers and complicit Lithuanians. Many Lithuanians don't make any distinctions between the Soviets who tortured and killed thousands of Lithuanians and the Nazis who did the same to millions of Jews.